Khanlibrary – Page 2 – Join me on my journey as I add more books into my library. Why do we find dystopian novels so intriguing? I often ask myself this question every time I crack open a new dystopian book that promises me many hours of reading about a future world where a plague has wiped out half of the population or humans themselves created the downfall of society. I do believe what makes a dystopian novel truly memorable is when the reader puts the book down, takes a deep breath and says, “yep, it may seem crazy but I can see it happening”. That is a truly terrifying thought that makes you reflect on the world we live in and what could happen in the distant future. Vox by Christina Dalcher left me with such thoughts. This book will make you angry. This dystopian novel is set in a future America where the government has decided women are to be silenced by allowing them to speak a maximum of 100 words per day. Women wear counters on their wrists that keep track of the number of words they speak in a day. If they go over 100 words, they will suffer severe consequences. Overtime, women no longer hold jobs and girls are no longer taught how to read or write. Girls who speak the fewest words in school are given rewards. Half of the population has been silenced. Dr. Jean McClellan was a renowned linguist and a mother of four before the counter was slapped on her wrist. She did not resist when the counter was placed on her six year old daughter’s wrist, despite knowing what happens when speech and language is taken away from a child. The men in the book play important roles as the story progresses. Jean’s husband, Patrick reminds her and their daughter Sonia when they are running low on words. He uses close-ended questions when communicating with his wife and daughter as the counter gets dangerously close to 100. Jean has to watch her husband and sons openly communicate with each other while her daughter shakes or nods her head throughout dinner. Jean also watches her oldest son get pulled into the “pure movement” as he follows the very men that silenced his mother and sister. Jean finds herself becoming resentful as she watches the men in her life enjoy the freedom of speech that was taken away from her and Sonia. When a group of men in power reach out to Jean asking her to come back to work for a mission, she has an important decision to make: Do as she is told and enjoy a temporary freedom of speech for herself and her daughter, or fight like hell to free all the women who have been silenced. I think what caught me off guard was the unique twist on a way to silence women. While I have read similar stories like The Handmaiden’s Tale, this book offered a new and terrifying scenario of women wearing word counters. This part of the story horrified me and captured my attention from the very start. I was completely enthralled by the story and I was anxious to know what Jean would do and how she would fight against the powerful leaders who silenced so many women. “There’s a resistance?” The word sounds sweet as I say it. I was not expecting the disturbing twist that came when Jean figured out what the men in power were planning for the future and what role she was to play in it. Just when you thought it couldn’t get worse than word counters, it does. I was caught off guard and I became even more fearful for Jean and her daughter. It was a genius twist that made me incredibly angry all over again. I also thought that the character of Sonia was an important motivating factor for Jean. I felt her pain as her daughter’s counter went over 100 words. It was heartbreaking, and I could feel a mother’s anguish in that very important scene that pushes the story forward. While I was completely absorbed in the story, there were several flaws in the writing style along with the resolution towards the end. I found the buildup to be fantastic, but the climax was quick and book ended far too quickly. I was confused by the conflict and chaos as the ending was approaching. I do feel like the author needed to slow down and not rush the resolution. I thought there were too many characters involved in the conflict and the big scene in the end. This only made the ending more perplexing and it made me question several character’s motives and reasoning. Furthermore, some of the characters did not feel well developed enough. I would have enjoyed knowing more of their backstory or just getting under their skin and finding out what drives them. Overall, this book was very thought provoking and important to read. I felt heavy after reading it but I also found myself reflecting on the world we live in. There were so many questions and thoughts that went through my mind while I as reading, and I think that is the big takeaway. Despite the numerous flaws, this book makes you think and ask questions. If you ask me, the author succeeded in terrifying us with a dystopian novel that made us ask the question “what if” and shudder from just the thought of it. This is not a love story. No, this is something far greater that cannot be placed into one category. “Circe” by Madeline Miller is a story that is devastating, heartbreaking and breathtaking. It is a story about magic, betrayal, love, loss and self-discovery. It is about family feuds, ancient rivalries and politics. Moreover, it is about the triumph of a woman living in a man’s world. Here is a book that is rich in Greek mythology with a fierce female character that is unlike anything I have read in a while. Can we also take a moment to appreciate the cover art? I mean, I know we are told not to judge a book by it’s cover, but come on! From the moment Circe was born, she was cast aside as worthless nymph. Born into the house of Helios, god of the sun and a Titan, Circe was vastly different from her powerful father. She would be mocked for having a voice of a mortal and no power of her own. Feeling like an outcast amongst the gods and goddesses in her own home, Circe turns to the mortals for companionship and soon discovers her powers for witchcraft. As her powers grow, Circe finds herself being able to transform her enemies into hideous monsters. It is not long until the all-powerful Zeus feels threatened by Circe’s powers and sends her into exile on the Isle of Aiaia. It is on this island where she learns that being a goddess and an immortal will not save her from the horrors this world has to offer. Circe learns to rely on herself for protection on this desolate island by focusing on strengthening her powers. Her exile is long and we join her on her journey as she overcomes some brutal and heartbreaking encounters with visitors on her island. I have always been a huge fan of Greek mythology. I liked that while this book focused on Circe and her life, we also got a glimpse of some other important characters. We get a brief encounter between Circe and Prometheus before he is cursed to spend an eternity bound to a rock with an eagle feasting on his poor liver. I loved this part of the story (the encounter, not the liver feasting) as it focuses on the human and gentle side of Circe as she shows some kindness towards Prometheus during his torment. This was such a small part of the book but it left a tremendous impact on Circe and it became a turning point in her life. While Circe lives in solitude for many years, she did have a few relationships during her time in exile. The famous Hermes and Odysseus make an appearance in her story, but Circe handles these relationships on her own terms. These are not necessarily happy love stories, but she takes what she wants from each relationship to help her become the person she wants to be. The relationships she has with the mortals are also explored and I found these to be the more interesting relationships in the book. As we read about Circe becoming that infamous witch of Aiaia, we see her growth as she overcomes the shadows of her past. While she was treated as a worthless nymph by the gods, she soon finds herself being treated as a toy to be used by some of the monsters in the mortal world. It is not until a harrowing encounter with some of these mortals that she decides to change her narrative by using her powers. It is through her magic that she finds her freedom as she learns to protect herself and those she cares about. Circe’s other tense relationships are explored, notably between her siblings and her father. It is painful to read about how Circe yearns for love and acceptance from her family. The family dynamic is definitely strained and very complex, which leads to many confrontations. It also helps Circe find peace in her solitude and acceptance about her family and their indifference. We also see Circe struggle to understand her place in the world. She is a goddess who has been mistreated by her own kind. She is also a goddess who has a soft spot for the mortals. Reading about Circe trying to choose between these two worlds was probably one of my favorite parts of this book. Madeline Miller is quite the storyteller. The writing is beautiful and so descriptive that it feels like I can vividly picture Aiaia in my head. It was very interesting reading about all these famous characters from Greek mythology through Circe’s perspective. If you follow Greek mythology, you will know what happens to these characters but reading it from Circe’s perspective almost feels like you are reading about these characters for the first time. Furthermore, Circe’s growth is what really kept me invested in this story as I was rooting for her from the very first page. You really get a sense of how powerful and intelligent Circe is and you are just waiting for her to realize her potential. I highly recommend this book even if you do not care for Greek mythology. Step out of your reading comfort zone and get lost in this gem. What do you get when you have a book filled with family drama, gossiping, scheming, backstabbing and a love story doomed from the beginning? You get a great summer read! Rachel Chu is a professor of economics and an ABC (American born Chinese). She has been in a relationship with her boyfriend, Nick Young, for two years. During the course of her relationship, she learns very little about his family. Until the day Nick invites Rachel to his friend’s wedding in Singapore. Finally Rachel will meet and learn more about Nick’s family. While she is nervous at the prospect of meeting her boyfriend’s family, she is in for a big surprise and culture shock. As it turns out, Nicholas Young is one of Asia’s most eligible bachelors. He grew up in a home that looks like a palace, has access to private planes and has relatives that spend over $25,000 on outfits. Rachel was not prepared for any of this and she finds herself being swept into the stunning world of some crazy rich Asians. While Rachel is both dazzled and overwhelmed by the way Nick’s family and friends live, she soon realizes that she has a target on her back. There are many people who do not believe Rachel is good enough for Nick and will do everything in their power to get her out of the way. I love books that explore different cultures and I must admit that I did not know much about Singapore’s culture until I read Crazy Rich Asians. Of course, the culture that was explored in this book was that of the immensely wealthy Singaporeans. I really enjoyed reading about Rachel experiencing culture shock. There are plenty of hilarious scenes of Rachel exploring their world and trying to wrap her mind around the price tags. It felt like I was learning along with Rachel, and getting shocked as well. I felt overwhelmed just reading the descriptions of the elaborate mansions and extravagant wedding festivities. There were many themes that revolved around family, relationships, class and prejudice. However, what stood out for me the most were the differences between the old generation and the new generation within the families. The older generation was portrayed as holding on to their culture values and their beliefs. They did live extravagant lives but they believed in privacy. Some were set in their ways and had expectations that needed to be fulfilled by their children. The younger generation were portrayed as showing off their wealth and spending their money on the latest designer brands. They were on a quest to own more, be caught on camera looking like the perfect family or just sabotaging those around them to get what they wanted. There were also many “mean girl” moments in this book that had me stressed out. Poor Rachel Chu never had a chance and was not well prepared to deal with the vicious mean girls that labeled her as a gold-digger from the moment they heard of her. She was also not prepared to deal with the older ladies who schemed together to sabotage her relationship with Nick. Crazy Rich Asians was a fun summer read. While you may find that the descriptions of characters and the environment can be long at times, I urge you to read through it because it does help you understand the world Kevin Kwan created. Enjoy and do catch the movie as it comes out later this month. When visiting a new city, what is one of the most important things on your itinerary? For me it is finding the town’s best bookstore and finding food. Since this is a book blog, lets focus on the books. When I visited Victoria in British Columbia this past week, I made a note to look up a few bookstores. I also made a note of packing light in case I found more books to bring back home. Imagine my joy when I found out there was a very well known and beautiful bookstore right next door to my hotel. That is what I call serendipity! Located in the heart of downtown Victoria, this bookstore has is very hard to miss. The first thing that caught my attention as I walked in was the beautiful architecture. You can tell that the building has been modernized but that old school charm has been maintained as well. There are also beautiful fabric banners on one side of the wall that depict the four seasons. Back home in Montreal, I tend to spend most of my time in Chapters/Indigo and sometimes venture out to the used bookstores scattered around our city. It was great to explore something completely different from what I am use to seeing. The selection of books ranged from new releases, classics, autobiographies, cookbooks and so much more. 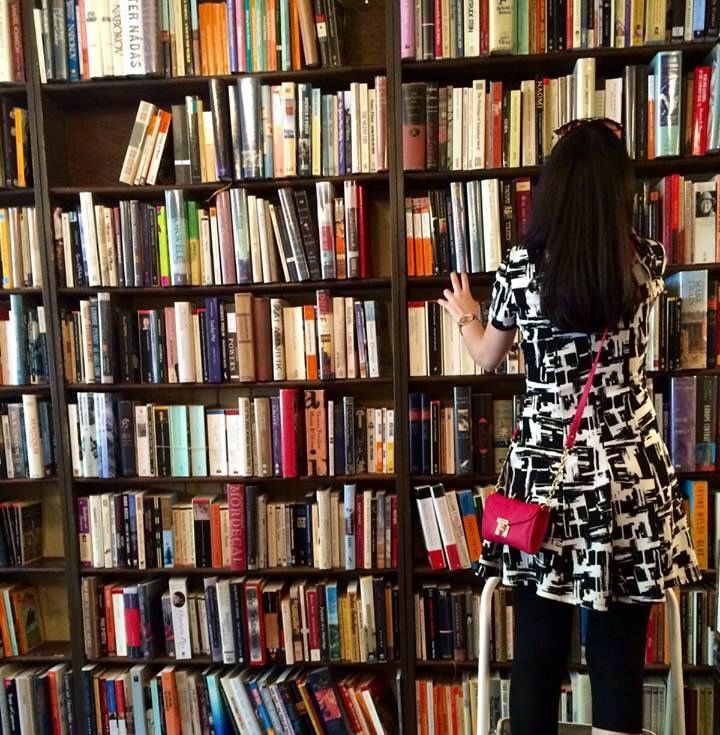 There was a whole wall of fiction, which I gravitated towards right away. I was also grateful for the section with staff picks because all the options were overwhelming me. Needless to say, I was ready to give away all my money to this cute bookstore. There was also a nice tourist section with books about Victoria and it’s many attractions. I quickly flipped through some of these books and added a few spots to my itinerary. The staff was incredibly kind and attentive. One of the staff members even gave me a bit of a history lesson regarding the bookstore and the first owner. There were also various bookish items for sale at reasonable prices. I came close to buying a “I love Mr. Darcy” tote bag but a quick poll on bookstagram gave me the impression that it would be next level cheesy. Looking at my boring tote bag right now, I realize leaving it behind was a mistake. Quick advice: always buy the bookish item! Munro’s Books is located at 1108 Government Street Victoria, BC. I was already on cloud nine from my experience in Munro’s Books. Then comes along a little message in my instagram DM from a fellow bookstagrammer who tells me there is an even bigger bookstore located just three blocks from where I am staying. Needless to say, I fired up my GPS and made my way to the location. Can I say serendipity again? Yep, there are two floors of endless piles and aisles of books. The fiction section was gigantic. It took me a while to make my way through each aisle and trying hard to pick just one book. There was also staff recommendations when you feel too lost or overwhelmed by all the options. There are piles of books lying around on the floors as well so you never know where your next great find will be hiding. The books were generally in great condition and the prices were very reasonable. Of course the staff was very welcoming and helpful. Russell books is located on 734 Fort St, Victoria BC. Of course you are always drawn to what you know. Walking out of Russell Books, I saw Chapters down another street so I decided to give it a little visit. It feels weird entering another Chapters and not knowing where everything is located. It made me realize how I am usually on autopilot in the bookstores in Montreal. Having three bookstores in close proximity to each other made it a fun little afternoon of bookstore hopping. Since I was only in town for a couple of days, I could not spend too much time at each location. Therefore, I believe another trip is due soon to fully experience these places. I brought one book along with me on my trip to Victoria. Into the Water by Paula Hawkins seemed to be an appropriate choice and I thought it would make a great beach read. However, I underestimated how distracted I would become by Victoria’s beautiful scenic views. This made paying attention to the book very difficult. Even reading on the plane was cut short when I looked out the window and saw the mountaintops. Sadly, I did not get far in my reading but my book did end up making its way through many beautiful locations. If you are going to the Canadian westcoast, it would be really easy to forget about bookstores and enjoy your time by the water. However, I strongly recommend taking a stroll in these two bookstores. Even if you are not a reader, I believe you would enjoy the gorgeous architecture. I remember reading a comment on Goodreads about Ruth Ware becoming the Agatha Christie of our times and I cannot agree more. Ruth Ware’s books are eerie page-turners that have kept me up till the wee hours of the night reading till my eyes were bloodshot and my mind was reeling. I love psychological thrillers and murder mysteries and I have found that Ruth Ware’s writing has a creepy tone that keeps readers on the edge of their seats. You just feel that something is horribly wrong and something bad will happen. You also find yourself asking many questions throughout the book: Can you trust this character? Can you really trust any character? Who is the murderer? What in the world is going on? Ruth Ware, how do you come up with this stuff? Yep, many questions! First off, Ruth Ware’s newest release has the most intriguing cover. Just looking at the black and white cover with the intricate gate filled with magpies and cobwebs was enough to grab my interest. The novel introduces us to Harriet Westaway, a young woman struggling to make ends meet ever since her mother passed away. Harriet is a tarot reader who has the eye for observing human behaviour and figuring out the reason why people visit her. When a loan shark threatens to turn Harriet’s life upside down, she turns to what appears to be her only hope: a mysterious letter addressed to her stating that she has come into an inheritance left by her grandmother, Mrs. Westaway. The problem: Mrs. Westaway is not her grandmother. Harriet decides that life has knocked her down enough and that money can be her turning point. She embarks on the journey to her “grandmother’s” funeral and starts working her cunning plan to convince the family members that she is part of their family. Things take a dark turn as Harriet’s lies get out of hand and as she gets pulled deeper into the family secrets. She starts realizing something sinister is at the heart of their house and past. The description of the creepy mansion fit into the storyline so well. The image of the cold, worn down home filled with secrets was so vivid in my mind. The feeling that everyone in this book was up to no good overwhelmed me. I questioned the characters motive and analyzed their behaviour with each turn of the page. I can tell you that I did not see that twist coming in the end. I finished this book in a day and I think I was so wrapped up in what I just read that I could not process what I felt for a couple of days. All I can say is, this is a Ruth Ware novel so be prepared for the creepy factor and a lot of suspense! When travel writer Lo Blacklock gets an assignment aboard a luxury cruise, she believes she has scored not only a big step in her career but some much needed time away from the drama of her own life. She soon realizes that this voyage will be anything but relaxing and more of her own personal nightmare. When Lo believes she witnessed a murder aboard the ship, she tries her best to convince the cruise staff of what she thinks happened. However, nobody seems to believe her and everyone is accounted for on the ship. There is no evidence of foul play and Lo eventually begins to question her own sanity. The biggest question: Who is the woman in cabin 10? This book had me questioning my own sanity as I kept trying to find answers to my questions or predict what would happen. Of course all my predictions were wrong, but I enjoyed how the mystery unravelled. Another hit by Ruth Ware! What happens when you take a couple of women with a past and place them in a dark and deserted cottage in the woods for a bachelorette weekend? Nothing good that’s for sure! Another eerie story about how lies and secrets from a decade earlier unravel in the most unexpected and horrifying way. I was quite shocked by how this story took a turn in a direction that I was not expecting. This book was a quick read for me and was perfect for those long commutes to and from work. Just make sure you are paying attention to your bus stop (learn from my mistakes folks). If you are looking to get swept away by a book then Ruth Ware is the way to go. I would take The Woman in Cabin 10 on vacation and I would read The Death of Mrs. Westaway on a rainy day snuggled up in a blanket and a cup of tea. Either way, you cannot go wrong. They are the kind of books you will read fast because you need answers to your questions.